Maud and Everett Lewis are “like a pair of odd socks”, living in a remote cottage in Nova Scotia. He sells fish and chopped wood. In the film Maudie, we see her slipping away from living with her uncaring aunt to move in with Everett as his housekeeper. But Maud’s talents are not limited to cooking and sweeping. At first, the brusque man treats the determined and headstrong woman with contempt, verbally and physically abusing her. Disturbingly, witnesses do nothing to intervene. As Maud’s amateur painting starts to generate interest and much needed income, Everett is soon wheeling Maud on his cart across the field rather than firewood. However, his enthusiasm is tinged with jealously and their matrimony is threatened. 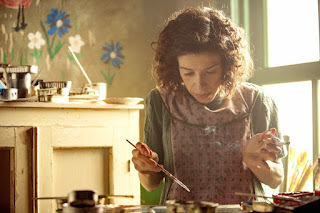 Sally Hawkins is spellbinding as Maud, capturing the effect of rheumatoid arthritis in her gait and in the difficulty making the fine motor movements required to paint. Nearly every line is delivered in a whisper as her condition worsens. Hawkins’ hunch and furrowed brow tighten, and the character seems to grow older and quieter in each scene. Yet this isn’t a film or a character defined by disability. It’s about Maud’s creativity, her tenacity, the smile that accompanies her wry observations, her pleasure in the small things. Even though she lives and works in the tiniest of dwellings, its windows and door give her a view of the windswept landscape, and her influence stretches right the way to the White House in Washington DC. Ethan Hawke brings an enigmatic quality to the distant Everett who is entirely unsuited to employ a housemaid. He starts by delivering brutally dismissive lines without flinching, while later on discovers his character’s heart and warms it up to act out some touching scenes with compassion. 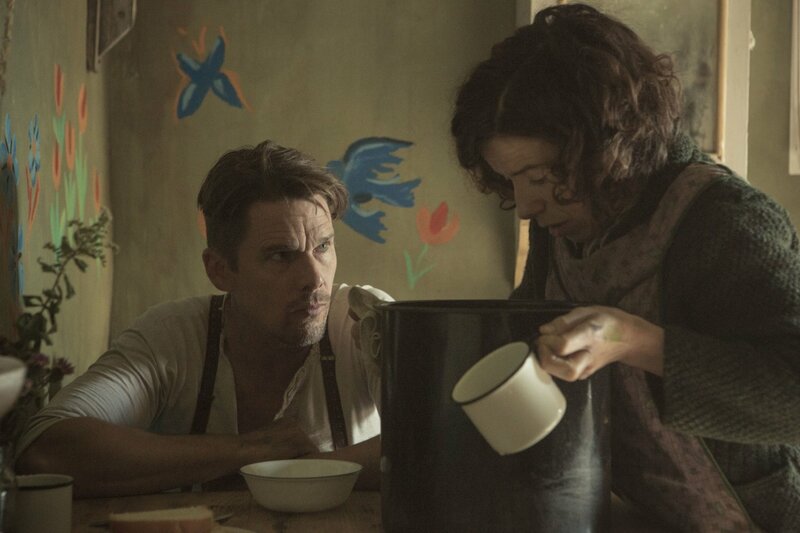 The unconventional couple’s unconventional chemistry evolves gently, with director Aisling Walsh allowing the unrushed alchemy to proceed at the walking speed that dominates 1930s Marshalltown in Nova Scotia. Sherry White’s screenplay hints at much but explains very little in the opening scenes. The burden of Maud discovering the truth about her dead baby is all the more powerful when we realise just how callous her brother Charles (Zachary Bennett) can be. I felt a little cheated that the stubborn and persistent lifeforce of Maud was missing from the last few minutes of the film. But then I could barely see the screen for tears as the heartbreaking story concluded. This biographical tale would be too slow for the stage. The real life of Maud Lewis is perhaps even more tragic than the film version. But enough of her life force is captured to create a thoughtful and haunting piece of cinema that deserves two hours of your life to view. 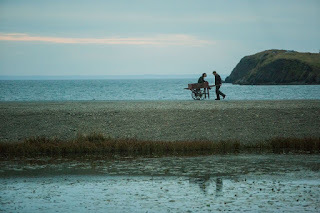 Maudie is being shown in the Queen’s Film Theatre between Friday 4 and Thursday 17 August.